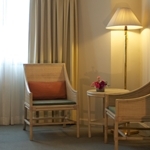 Each of the 205 rooms is comfortable, air-conditioned with good quality linen and amenities. The hotel does not go for a luxurious design but we’d rather keep everything simple yet elegant. Most important thing, we keep the rate reasonable to everyone. Superior Rooms are located on 3rd-8th floors. The earth tone color scheme brings a warm and invited and a feeling of spaciousness.